It’s truly remarkable that so many young kids are sacrificing their birthdays to honor police officers, and no one appreciates it more than cops do. 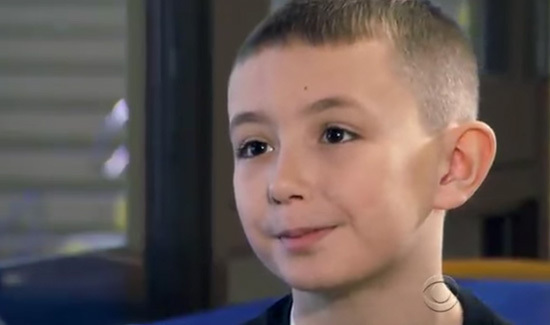 According to CBS News, an 11-year-old kid that wants to be a police officer someday decided that instead of cake and presents, he wanted to spend his birthday throwing a party for police officers. “I’m throwing them the thank you party to show them I still appreciate them,” said 11-year-old Jeremie Bordua. His efforts were massively appreciated by beleaguered and demoralized police officers all over Michigan and beyond. Some officers traveled from other states. Deputy James Revell drove there from Georgia. “Because he saw not every police officer is bad. We’re human beings and that’s what he sees in us,” Revell explained about why he came all the way to Michigan. “Here’s one person that really recognizes what we are truly out here to do,” another officer told CBS News. “There just aren’t kids like that,” said Gary Hall, who flew in from Los Angeles. Needless to say, what with all the Beyonce nonsense, it’s nice to know that cops still have some fans out there. This is awesome. I wish myself to be a police since I was in 7th grade and now I’m in senior 12th grade. I so exited myself to graduate this year and become my dream to come true a police of department public safety of school’s.